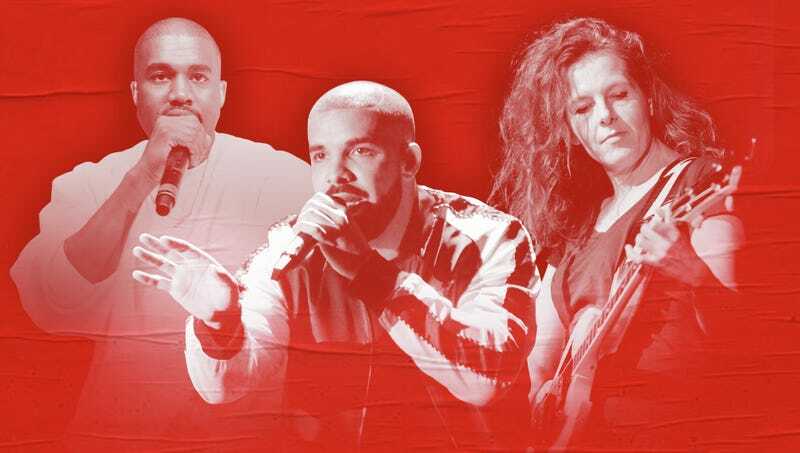 Kanye West (Photo: Scott Dudelson/FilmMagic via Getty Images), Drake (Photo: Kevin Mazur/WireImage via Getty Images), and Neko Case (Photo: Frank Hoensch/Redferns via Getty Images). Graphic: Natalie Peeples. Following May’s especially strong lineup of releases, June brings long-awaited returns from Neko Case, Nas, Lykke Li, and Gang Gang Dance, as well as anticipated efforts from Drake, Oneohtrix Point Never, and Zeal & Ardor and promising debuts from Snail Mail and Juliana Daugherty. In hip-hop, it is undoubtedly the month of Kanye, with the rapper-producer involved in at least one release every week. These are the albums we’re most looking forward to in June.